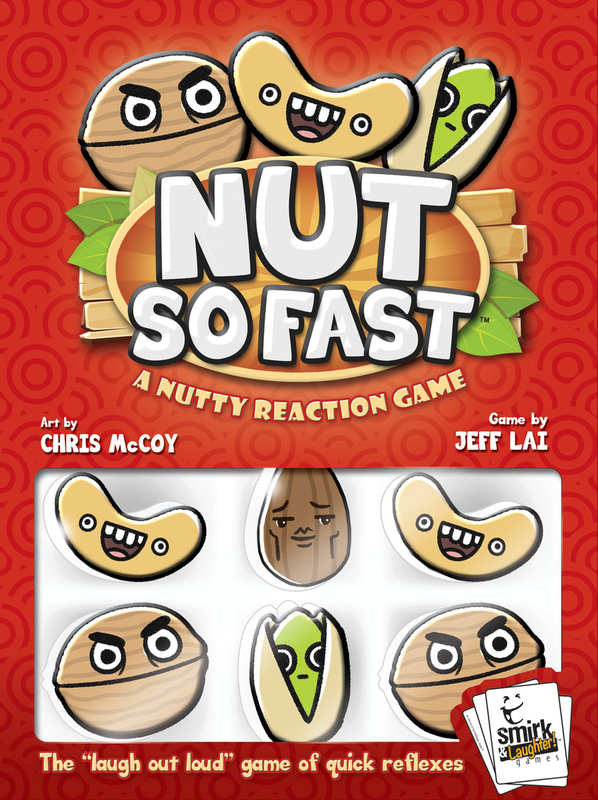 Nut So Fast is a game by Jeff Lai, published by Smirk & Laughter Games. It is for 3-6 players. In this game, players will be flipping over cards and watching for special triggered events. Once they see the correct trigger they will need to race to grab the correct nut from the table or strike the correct pose. Of course the slowest player will be forced to suffer the consequences. They will have to be fast if they hope to win and score the least amount of points. In the end, the player with the lowest score will be declared the winner. To begin, the Almond and Pistachio are placed in the middle of the play area, within reach of all players. A number of Cashews are placed around these 2 equal to the number of players minus 1. The same is done with the Walnuts. Each player is given 1 blue Base card with the words, “Score the Round” on it. The red NUTS! cards are shuffled together and dealt out face down to the players as equally as possible. Players are not allowed to look at the cards and must place their stack of cards in front of them at the edge of the table. They must also place the blue Base card at the bottom of their stack. The double sided number cards are placed in order to one side of the play area within view of all players. The Nutty Pose cards are shuffled together and 1 card is placed beside each number. Players will then go over the poses, performing each one and saying the number aloud. The first player is chosen as the active player and play now begins. The game is played over 3 rounds. During a round, each player will flip over a pair of cards from their deck in front of them, starting with the active player and continuing in turn order. When flipping each card, the player must flip the card away from them so as not to give an unfair advantage to the player flipping the card. Each card flipped will cover any flipped cards from previous turns. When a card is flipped, players will be looking for one of the triggers that will cause them to react quickly. There are 4 different triggers. If there are exactly 4 matching nuts, then players must grab the corresponding nut from the middle of the play area. If there are 7 of the same matching nut, then the players must try and grab the Almond. The same thing happens if there are two sets of four matching nuts or 8 of a single type of nut. In either case, the players must race to grab the Almond. If a number card is flipped, players must ignore the nuts and strike the correct pose from the corresponding number on the side of the play area. Once the trigger has happened, the slowest player to react must take a consequence. If the player was too slow at grabbing a Cashew, then all the face up cards in front of the active player are placed underneath the slow player’s base card to be used as points against them. The same penalty happens if they were too slow at grabbing a Walnut. With the Pistachio, only the fastest player will be able to grab it. In this case, the player will take all the face up cards in front of the active player and choose a player to place the cards underneath their base card as points against them. Just like the Pistachio, the Almond will only be grabbed by the fastest player. For this player, they will not touch the active player’s cards. Instead they will be able to take all the cards underneath their base card and place them on top of their deck, cancelling out any points against them. If the player was too slow at striking the correct pose from the number card, this player must take all the face up cards in front of the active player and place them beneath their base card as points against them. It should be noted, that any time a player grabs the wrong nut by mistake, they must place 2 cards from the top of their deck underneath their base card as points against them. Once the consequences of a trigger have been resolved, or no trigger occurred, then play passes to the next player in turn order who then becomes the active player. The round continues until a player’s blue Base card is exposed on top of their deck. The active player finishes their turn, with players completing any triggered events. Scoring occurs at this point. To score the round, each player counts up the number of nut cards below their Base card. The number for each player is written on a separate piece of paper. Once completed, a new round is set up the same as during set up. The Nutty Poses cards are discarded and replaced with 3 new cards from the deck. The player that ended the round becomes the new first player. Play resumes in the same way as previously described. It should be noted that if a “?” is revealed as one of the Nutty Poses, then the first player decides what the pose will be. The game continues until 3 rounds have been played and scored. After the third round has been scored, players add up their total points and the player with the lowest total score is the winner. This game comes with some really great quality pieces. First off there are the giant wooden nuts. These are really big and chunky pieces that are painted white and have a particular nut printed on one side. There are 5 walnuts, 5 cashews, a pistachio and an almond. These are really nice and I like the heft and feel of them. The designs are all silly and fun. The other component in the game is a huge stack of cards. There are 4 different types of cards. There are the 3 double sided number cards for placing a Nutty Pose beside. These are numbered 1 to 3. Next there are the Nutty Pose cards. These have a special pose on one side that the players may have to try and pose like if a number card is revealed from the Nuts! cards. There are also 6 blue base cards with the words, “Time to Score!” on them. This lets players know when the round is over. Finally there are the Nuts! cards. These have different images on them, usually containing one or more of the nuts. Sometimes, there will be a number instead of a nut. As mentioned earlier, these will cause the players to strike the corresponding numbered pose. There are also some reference cards that help each player know when to grab one of the nuts from the middle of the table. Each of the different card types are completely square and are not the normal playing card size and shape. However the finish is very similar to that on most playing cards. I really like the designs and look of the different pieces, especially the wooden nuts. They are really silly looking. Overall the components of this game are very good. I really like what you get with this one. The rulebook is fairly small and very simple to read. There are plenty of pictures and examples throughout the book. Everything from setup to explaining the different triggers is covered in great detail. The back of the book even has a trigger reference chart which is a bit larger than the reference cards included with the game. This is really great for some of the older players or anyone with vision problems that might need a bit larger print. This is one book that most likely won’t need to be read through more than once, as the rules are pretty simple. The only thing that might need referenced would be the scoring rules for each of the different nuts and possibly the triggers. Other than that, I think it’s pretty easy to understand. Overall I think the designer did a great job with the layout and explanation of the rules. There’s nothing that should be difficult to understand. I’m very pleased with the look and feel of the rulebook. This is one wild and silly party game that I really enjoy. Let’s face it, most party games are rather boring, at least to me they are. This one doesn’t have you trying to draw a picture or match up some cards to make a silly combination. It’s all about being the fastest person to grab a big silly looking wooden nut or striking a humorous pose when the trigger occurs. That’s pretty much the game right there. I know that sounds pretty simple, but what is not mentioned in those few sentences is that the laughter and fun that you’ll have playing this one far exceeds your daily dose of recommended hilariousness. Just looking at the wooden pieces makes me chuckle. Add in the silly poses and the franticness of players trying to either be the first to grab one of the special nuts from the table or to not be the slowest player to do so. The game only lasts about 15 minutes but the laughter will last far longer than that. I will say that you really have to be paying attention to the card that each player flips over and be thinking of what you’re going to need to do. There are already 2 walnuts on one of the cards, if the next card flipped over has 2 more, you have to grab one of the walnuts quickly. Wait! That first walnut card also has 2 cashews. What if the next card flipped over has 2 more walnuts but also has 2 more cashews. You’ll need to grab that almond first if you want to remove all those negative points that you’ve already accumulated from being too slow previously. But what if instead of there being nuts on the card, there’s a number instead? Are you prepared to do you best impression of a fashion model and strike a pose? My kids love this one. The silly poses and high speed hilariousness makes all of us laugh. This is a game that we really enjoy. Normally I’m not that big of a fan of party games or dexterity games, but this one strikes the right balance between the two which simply works for me. Fans of party games or games full of laughter will most definitely enjoy this one, especially if they don’t mind a bit of high speed dexterity thrown in. Overall this is a game that I would highly recommend, especially for families. The kids will love it. 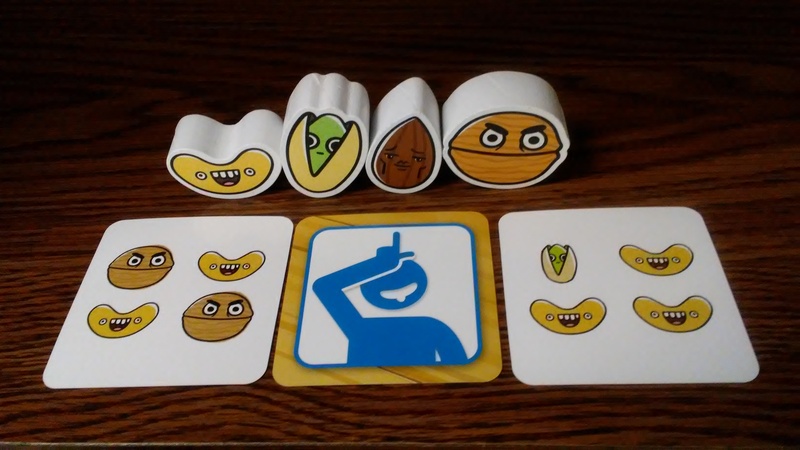 Nut so Fast is a silly game of dexterity where players will have to quickly grab one of the wooden nuts from the table or strike the proper pose. The game is very quick and can be played in about 15 minutes. The wooden pieces are quite large and silly looking. I really like the designs on each one. The cards are great quality as well. I especially like the nutty poses. This game reminds me of a party game but doesn’t bore me like most party games do. There’s plenty of silliness and fun wrapped up in this game. This is one that will make you laugh and keep you laughing. It’s family friendly and great fun with the kids. Fans of party and dexterity games will most likely enjoy this one. This is one that I highly recommend. It’s full of nutty goodness. This entry was posted in Reviews and tagged board, board games, card, card games, dagger, fast, games, jeff, jeff lai, lai, laughter, nut, nut so fast, smirk, smirk and dagger, smirk and laughter, so. Bookmark the permalink.